HAMBURG, Germany (Hypebot) Last week, at Cannes Lions Festival, Diddy pitched Revolt TV and Damian Kulash went in search of sponsors. But a huge part of the marketing and advertising Festival involves awards, one of which went to a unique project designed to take vinyl cool and create a hybrid analogue/digital marketing campaign for Germany's Kontor Records. Cannes Lions International Festival of Creativity is a major event for marketing and ad agencies with a wide range of awards. This year's competition received 35,765 entries from 92 countries. How they sort that out, I have no idea. 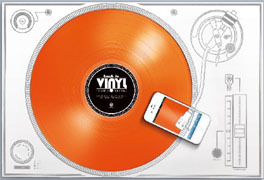 But once they did, a Media Lions Gold Lion went to "Back To Vinyl – The Office Turntable."